* Restrooms, water fountains, and free day-use lockers located on all three levels. * Centrally-located elevator connects all levels. 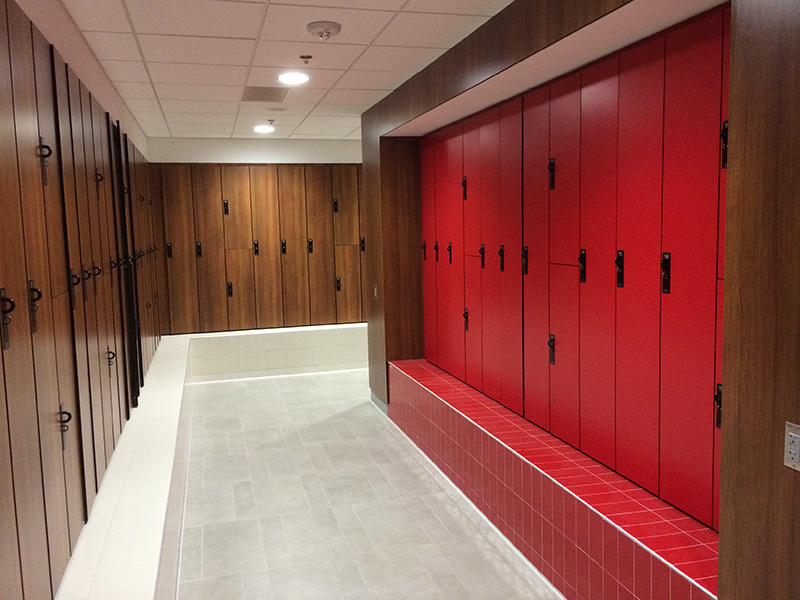 A limited number of men's and women's lockers are available for rent or upgrade on a first come, first served basis. Recently expired locker rentals must be renewed prior to any change or upgrade. Campus Recreation will provide locks for lockers in the locker rooms. The charges for lockers vary according to the size of the locker. Keep in mind that you must be a current member to rent a locker, except for at the Outdoor Adventures Center. A $10.00 refundable lock ($20.00 Bike Locker) and towel deposit is required when renting a locker at any location. Lockers may be rented on a annual year (September -August), academic year (September - May), or for the semester only (Fall, Spring or Summer). If you are a UNL employee using payroll deduction for your locker payment then you must have the annual locker option. If you decide not to renew your locker, please clear your locker and return your lock and towel to Campus Recreation Center Member Services or the Recreation & Wellness Center office. If you're serious about working out in the Rec Center, then you're going to sweat. Take advantage of our FREE Towel Check-out service. Just bring your UNL Student ID, and you can use a towel while you are in the Rec Center. Towel service is provided as part of the locker rental charge. If you are not a locker renter, you can check out a shower towel with your NU photo ID. In addition, free workout towel service is offered and may be used throughout the building. They should be returned prior to leaving. You may also receive a towel at Campus Rec Member Services or the Towel Check-out counter, across from the Fitness room. One towel is issued per individual, however, a soiled towel may be exchanged for a clean one as often as needed. 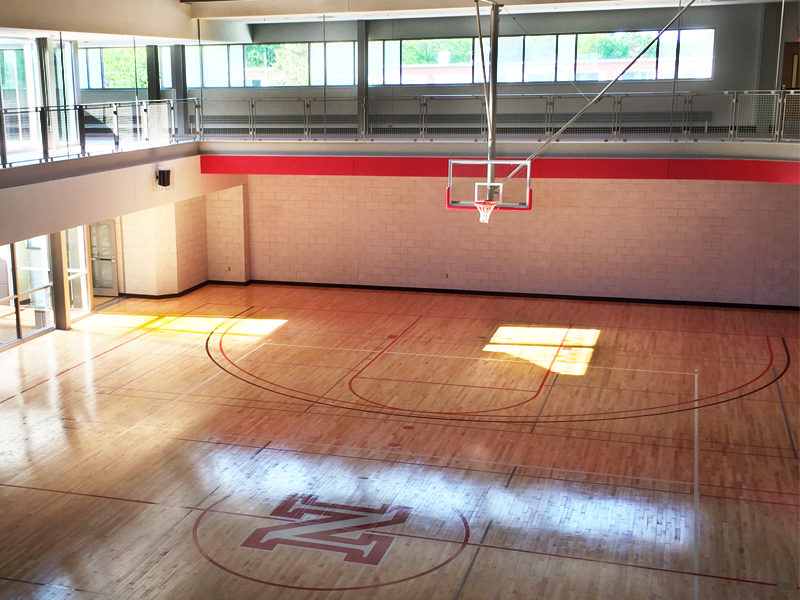 The University of Nebraska Recreation & Wellness Center has 2 multi-purpose courts for our members to enjoy. Members may reserve courts beginning at 10:00am prior to the day of play by phoning 472-4776 or in person at the Equipment Check Out window. Racquets are available for rent and balls are available to purchase at the Equipment Check Out window as well. Eye guards are strongly recommended and available for FREE check-out through Equipment Check Out of the Recreation & Wellness Center. Select weight training and free weight equipment, mostly consisting of Nautilus, is available for use. There is also a large variety of cardiovascular equipment, which includes Stationary Bikes, Precor EFX Elliptical Trainers, Stair Master Cross-aerobic machines, and Concept II Rowing Ergometer. Strength Training equipment that is accessible to wheelchairs or by use of optional wheeled seats, and can be used by four people simultaneously due to it's modular design. Four weight stacks provide over 20 different exercise patterns to work every upper body muscle group. The following items/activities are not allowed: food, gum, tobacco products, drug use, alcoholic beverages, spitting, dangerous weapons (as defined by the University's Student Code of Conduct), and personal items, e.g. backpacks, cell phones. All personal items should be checked in at the Towel Exchange or stored in a locker room. Water, in a re-sealable container, is allowed in the cardio area of the Strength & Conditioning Room (& other cardio areas). No other beverages allowed. Appropriate athletics footwear is required to be worn. Sandals, open toed shoes, boots, and hard-soled shoes are prohibited. Appropriate workout apparel is recommended. Street clothing is prohibited. 30-minute time limit on cardiovascular training equipment (i.e. stair stepper, rowing machines, cycles, etc.). Please be courteous and think of others. Collars are required to be used with all free weight bars. Spitting is permitted in cuspidors only. Spotters are strongly recommended when lifting all free weights. No scats can be done outside the rack. Do not hesitate to ask for assistance or for a spotter from any authorized supervisor on duty. Leaning equipment against walls and/or mirrors or removing equipment from this room is prohibited. Authorized supervisors only are allowed access to control desk and to operate the stereo, clock, phone, video, TV, and computer equipment. Youth age 13 years and younger are not permitted access to the Strength Training and Conditioning Room. Youth, in all cases, must be at least 4'10" tall (this is the minimum height for safe use recommended by the equipment manufacturers). Youth age 14-15 years must attend a free orientation before using equipment and must be accompanied and directly supervised by parent/guardian. Direct supervision means the parent/guardian must be sharing the same machine/apparatus or be on the machine/apparatus next to their child. Pre registration is required and can be made at the Recreation & Wellness Center Front Desk. Please ask supervisor if you have any questions regarding use of the equipment. They are trained to answer your questions and to assist you in utilizing the equipment for a safe and enjoyable workout. IT IS THE USER'S RESPONSIBILITY TO FOLLOW AND OBEY ALL POSTED RULES AND AUTHORIZED SUPERVISION. PLEASE ASK THE SUPERVISOR ON DUTY IF YOU HAVE QUESTIONS OR NEED AN INTERPRETATION. THANK YOU FOR YOUR ASSISTANCE IN MAKING THIS A SAFE ENVIRONMENT. Threatening physical harm towards a Recreation & Wellness Center employee (student or professional), participant, user, member, guest, or spectator. Verbally abusing a Recreation & Wellness Center employee (student or professional), participant, user, guest, or member. All Campus Rec classes, events, and activities are CANCELED. Campus Rec Center will open at 10:00 a.m. - Monday-Friday and at regular hours on the weekends. Recreation & Wellness Center will open at 10:00 a.m. - Monday-Friday and closed on the weekends. Outdoor Adventures Center will open at 10:00 a.m. and close at 8:00 p.m. any day of the week. 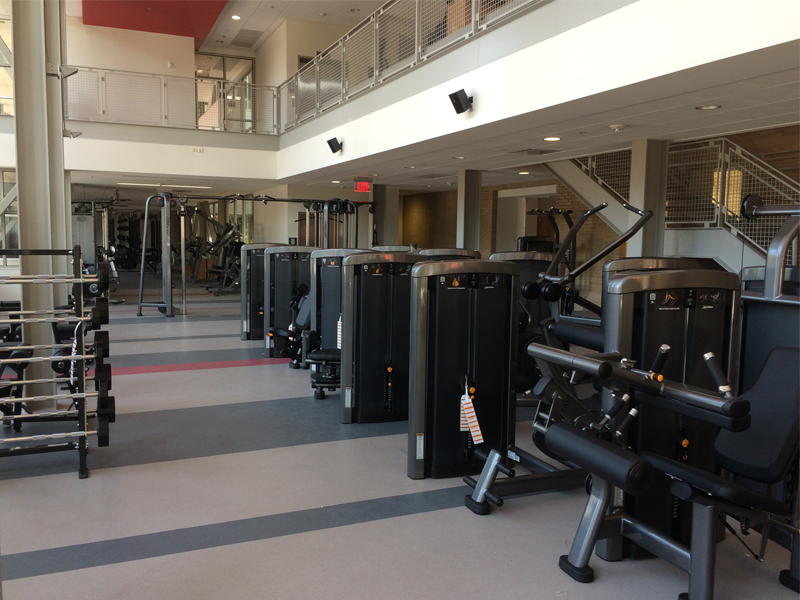 Campus Rec Center will open at 8:00 a.m. - Monday-Friday and at regular hours on the weekends. Recreation & Wellness Center will open at 8:00 a.m. - Monday-Friday and at regular hours on the weekends. Campus Rec Center will keep regular hours. Recreation & Wellness Center will keep regular hours. ALL FACILITIES MAY CLOSE EARLY DUE TO WORSENING WEATHER CONDITIONS. When University Holiday Hours are in effect Campus Recreation will follow the holiday hours established for Campus Rec Facilities. The hours are subject to change if Campus Rec decides the winter weather is severe. Please call Member Services at 402-472-3467 for the latest updates.